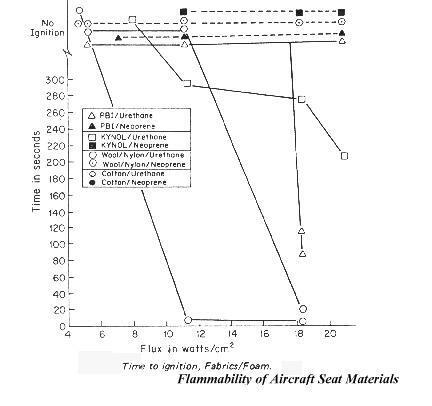 A major safety hazard in an on-board aircraft fire is the seat materials: both the fabric upholstery and the foam. R&D on polymer flammability has been going on for many years to develop materials with a low potential for ignition, fire spread and the generation of smoke and toxic combustion products. Major advancements have included brominating conventional materials to make them fire resistant as well as the development of thermally stable polymers (such as phenolics, polyimides, polysulfone, PEEK, and polyphenylenesulfide). In a seminal study, BlazeTech's founder concluded that direct replace- ment of commercial fire-resistant materials with these "advanced" thermally stable materials cannot be contemplated in the immediate future because of the cost and inadequate mechanical performance of the latter (cf. 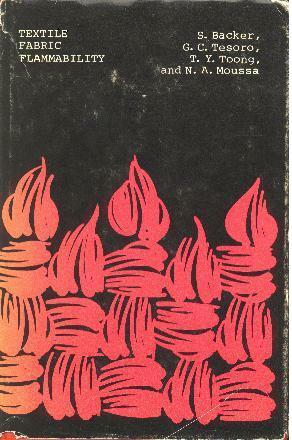 Materials for Fire Resistant Passenger Seats in Aircraft, by G.C. Tesoro and N.A. Moussa, J. of Consumer Product Flammability, Dec. 1977, pp. 201-616). Instead, he recommended judicious selection of state-of-the-art fire-resistant materials, and the innovative use of a heat barrier between fabric and foam. Such a barrier is now a common practice in the airline industry along with fire-resistant materials. BlazeTech provides consulting and testing services in both the physical and chemical aspects of material flammability. We even have the ability to model gas phase kinetics of halogen- dominated mech- anisms typical of fire supres- sion environ- ments. Our past experience with detailed inorganic halogen chemistry is state-of-the-art. The vaporific effect refers to the flash fire observed with the impact of high velocity projectiles against metallic targets. The impact produces small, finely divided particles originating from either the projectile, the target, or both. These particles are heated by the impact forces and can burn in the presence of air (oxidizer). The result is a metal-dust-type explosion with potentially significant overpressures inside the structure. This effect is particularly pronounced with pyrophoric metals (that react immediately upon exposure to air) such as aluminum. Due to their high strength to weight ratio, composites are being considered for the replacement of aluminum in aircraft structures. Composites were also believed to provide improved survivability under ballistic impact because of the absence of the vaporific effect. Recently, the Air Force at Wright Laboratory (WL/FIVS) in Dayton, Ohio, conducted ballistic tests of graphite-epoxy composites and aluminum panels in an empty tank (dry bay) and in open air under identical conditions. Under some conditions, the pressure and temperature rise in the tests with a composite panel exceeded the values with aluminum. This raised concern about the contribution of composites to aircraft survivability. WL/FIVS wished to conduct additional tests in this area. BlazeTech was tasked to review the results of the Air Force and related work by other agencies (if any), and to identify the type of measurements that should be carried out in future tests. This report presents the results of this small project by BlazeTech. Historically, ballistic studies have attempted to determine whether vaporifics is a chemical or mechanical effect, and conflicting claims have been published. The relative importance of these two processes depends on the characteristics of the target, projectile and environment -- and thus, it may differ from one set of circumstances to another. Over the years, NASA has sponsored a significant amount of research on hypervelocity impacts, particularly on the development of shields (or bumpers) to protect spacecraft by absorbing the impact of meteorites or space debris. These studies are typically conducted in the absence of air (to simulate space conditions) and at much higher velocity than those used at WL/FIVS. (NASA's lowest velocity is near the upper end of the Air Force, about 2.8 km/s or 9,200 fps.) These two differences accentuate the mechanical over chemical effects in the NASA work. Since our results in this study indicate that chemical effect pre-dominate for the test conditions of WL/FIVS, the NASA results are generally not relevant. Still much can be learned from NASA's novel experimental techniques and their qualitative description of multi-wall impacts. Basic flammability properties of composites have been measured at NIST including piloted ignition by thermal radiation, heat and combustion products generation rates, lateral flame spread rates and flame heights. In these tests, composites are typically subjected to longer-duration and lower-intensity heat fluxes than those of interest to our study. More relevant studies addressed the thermo-mechanical response of composites to intense heating from nuclear explosions, laser heating and the lining of rocket nozzles. Both experimental and analytical work have been conducted in this area. The analyses covered one-dimensional heat transfer, initially, and more recently three-dimensional models, including mechanical considerations. Such models show promise despite the complex response of the composite materials. These qualitative observations were corroborated by Blythe in ballistic tests involving single panels in free air. However, the two studies differed significantly in the reported flash durations: 3 to 10 milliseconds for Blythe vs. up to several 100 milliseconds for Ritter. Furthermore, the static pressure rise in the tank was roughly twice as high for a composite than an aluminum panel, and the gas temperature remained hot for a longer period, which suggests a higher potential for tank damage. 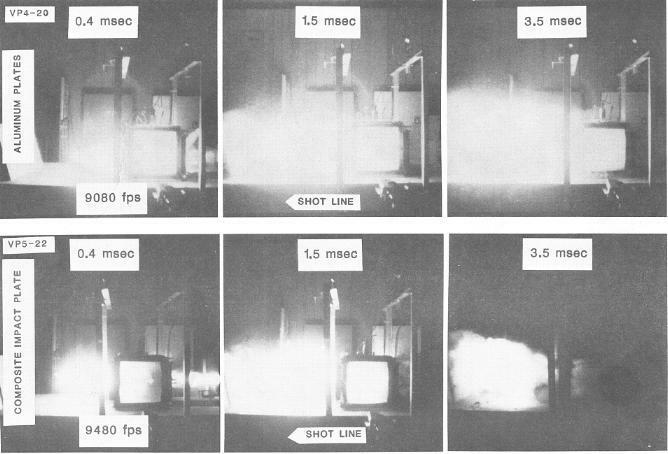 On the other hand, in a few tests with pre-mixed fuel/air in the tank, Ritter found ignition to require a higher impact velocity for composite than aluminum (6800 vs. 3600 fps, respectively). Similarly, Blythe found that the occurrence of projectile shatter and a flash fire (on the exit side of the panel) require a higher projectile velocity for composite than aluminum targets. Our project consisted of a characteristic energy analysis during ballistic impact, including: the kinetic energy of the projectile, the chemical energy of the projectile and panel debris, the heat of combustion of volatiles and carbon fibers the heat transfer from the flame to the panels and the walls, and the enthalpy loss during tank blow-down. We estimated the theoretical maximum energy, its time scale, and the amount of air consumed, drawing upon the test data of WL/FIVS. After flash extinction and box blow down, carbon fibers react with air arriving through the entrance and exit holes in the box. Based on our calculation, this combustion mode is the only exothermic process that provides sufficient energy release over the long time interval (500-1000 milliseconds) observed experimentally. This is a more likely explanation of the observed temperature- time histories for composite than the volatile combustion proposed by Ritter. The maximum theoretical energies were tractable by our analysis. Even more important are the actual energies released and their rates, but they are more difficult to calculate. Accordingly, we propose to measure them in future ballistic tests. First, we recommended that future tests include: (1) use of a box (not free panels) with volumes representative of real aircraft structures to faithfully duplicate the availability of oxygen; (2) use of test panels along all walls in the path of the projectile; (3) better simulation of heat transfer to the tank wall; (4) testing with and without fuel vapors inside the box (which affects air starvation inside the box); and (5) use of two boxes (simulating a dry bay in front of a fuel tank) to incorporate multiple impacts effects which are important. Second, in addition to standard ballistic measurements, we proposed calorimetric measurements to determine the heat released in the gas phase during the vaporific event. They include dynamic measurements (with sub-millisecond resolution) of heat flux, static pressure, and temperature inside the tank during the test, as well as key measurements before and after the test. A simplified method is presented to perform the required mass and heat balance calculations based on the measurements. In summary, the data suggested that a composite panel requires a higher speed to break up the projectile and produce an impact flash fire. Until then, it offers an advantage over aluminum. Once a flash fire is produced, radiant heat from the burning debris cooks off a thin outer layer in the rest of the panel (which does not occur with aluminum). The resin devolatilizes leaving behind carbon fibers. The volatiles burn in the flash fire raising the overpressure in the dry bay, while the remaining carbon fibers burn more slowly and sustain the temperature in the tank for several 100 milliseconds. Under these conditions, a composite panel would provide higher overpressure than an aluminum one. The implication of this result to dry bay survivability has not been addressed in this study. Finally, we recommended that a modeling effort be developed to describe the above processes. The model can be integrated with impact mechanics model such as FATEPEN 2, adding modules that handle combustion, heat transfer and overpressure. The modeling effort should also be integrated with the experimental program to serve as a tool for test design and result interpretation, and as well as a basis for rational decision on survivability improvements. For an investment company, we examined the market potential of a cogeneration technology based on a liquid-metal magnetohydrodynamic cycle. The institutional barriers to its acceptance by potential industrial users were assessed. For a major wood stove manufacturer, we characterized the solid fuel stove industry in terms of annual sales and growth rate, basis of competition and major technology and market trends. The study included an industry-wide questionnaire and interviews with industry leaders. For a major fabricator, we evaluated the market opportunity through the mid 1990's for the construction of modular power plants based on coal gas, fluidized bed and conventional fossil fuel technologies. For a number of clients, we evaluated the technical feasibility and economics of a number of new energy efficiency technologies. In each case, we identified the energy savings, the cost savings for various fuel and electricity prices, and other financial incentives. For a major engine manufacturer, we determined the size of the market functionally available to gas-fired industrial heat pumps in the U.S. The barriers to market penetration of gas-fired vis-a-vis electrical systems were identified. For a leading supplier of automation equipment, we determined size, composition and anticipated growth rate for factory automation controls that are used in motion control applications. For a major chemical supplier, we assessed the market opportunity for high performance engineering plastics as external body panels for automobiles. For a leading industrial control supplier, we assessed opportunities for growth in the use of process control equipment for factory floor applications. NASA selects Blazetech as 1 of 10 companies to advance technologies in space resource collection. Dr. Moussa interviewed in US News about phone/tablet dangers on aircraft. Dr. Moussa quoted in New York Times article about electronic device fires on aircraft. © 2018 BlazeTech Corporation. All rights reserved.